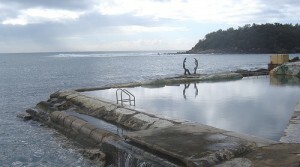 the formal recognition at local, state/provincial or national levels of the heritage significance of some ocean pools. Artworks in the form of murals, mosaics and statues further enhance the appeal of a few ocean pools. Those artworks are usually on the landward side of the pool, unlike these graceful statues sited on the seaward side of the ocean pool at Fairy Bower on Sydney’s Northern Beaches.